We offer an on-the-spot puncture repair service or tyre replacement and at quieter times can undertake other small jobs either while you wait or with a very quick turnaround. We do not take bookings in advance for larger jobs, your bike will simply join the queue as it sits when you bring the bike in. Turnaround depends on how busy we are, either pop in or give us a call on 0131 228 8820 to get an idea of how long it might take. 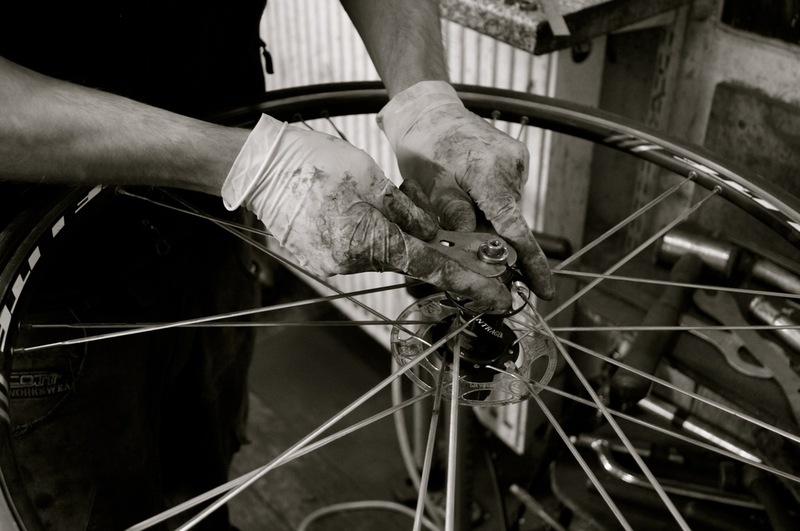 If for any reason you're not sure of the state of your bicycle, bring it in for a free estimate. This is useful on bikes which we’ve serviced previously. If we know that it has initially been set up correctly, subsequent work time involved is reduced. Got an event or competition coming up ? 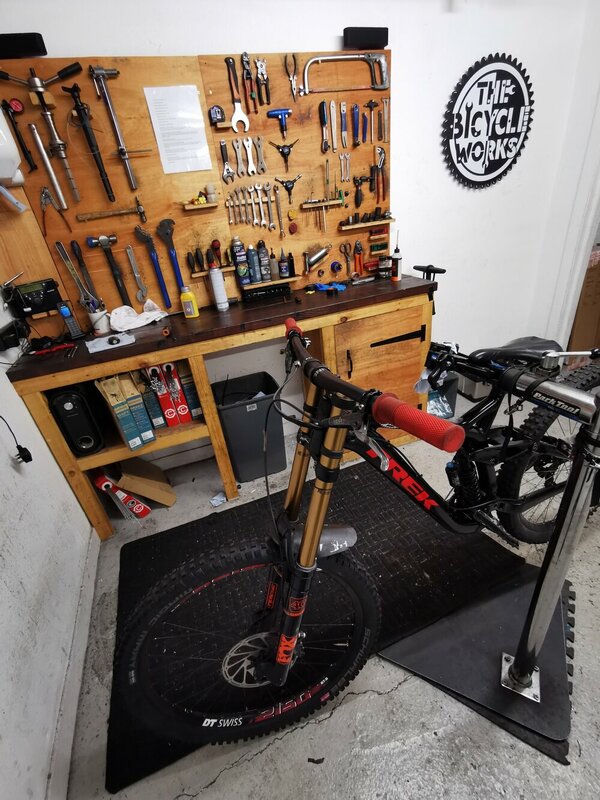 Have your bike checked over and set up correctly. There’s nothing worse than an unexpected mechanical failure! If you need any parts fitted such as brake blocks, cables etc. you only pay for the parts involved. 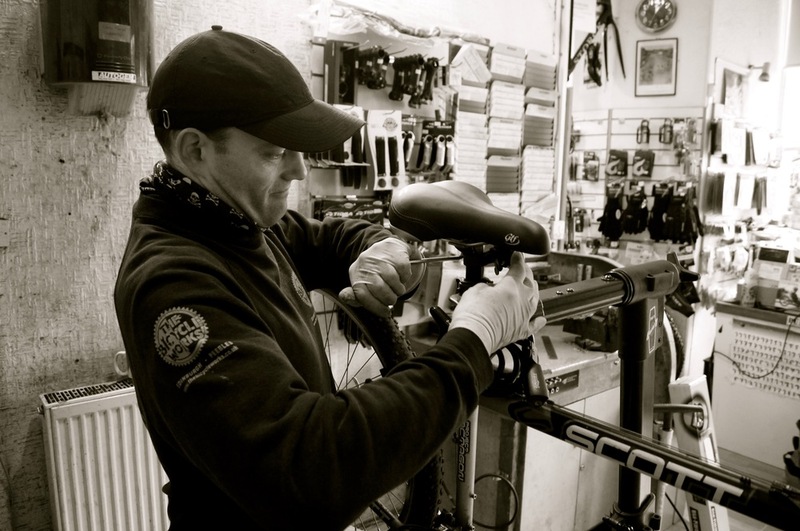 We don’t charge extra labour unless it’s something like a bottom bracket or headset replacement which could incur an extra £8 – £14. We reserve the right to change our product's prices at any time without notice. We work on all major hydraulic brake systems, with the exception of some Magura brakes. We keep various spares and have a huge array of common pads in stock. Due to the vast number of different bearings used in full suspension frames it is usually more time and cost effective for customers to supply complete bearing kits. Labour costs can vary depending on the condition of the frame. We send forks and shocks to TF Tuned for servicing, usual turnaround is 7-10 days. 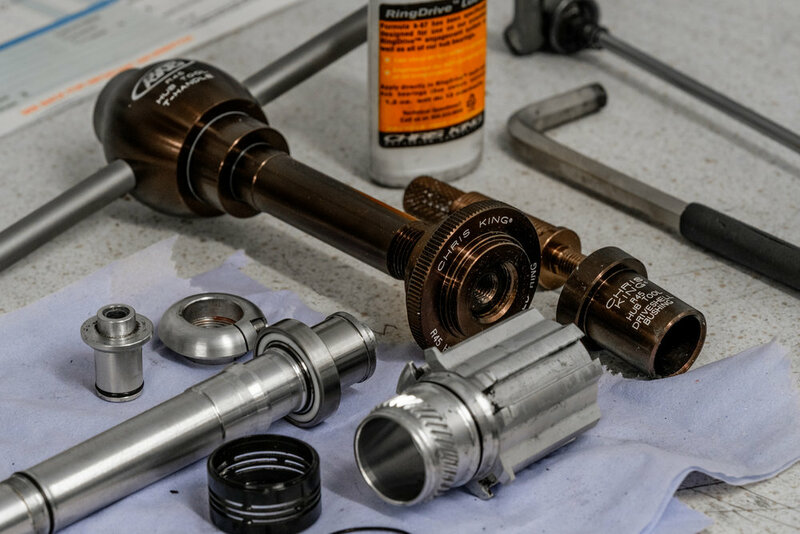 We have specific tools for servicing Chris King, DT Swiss, Hope and many other hubs. Labour costs vary depending on the complexity and condition of the hub. 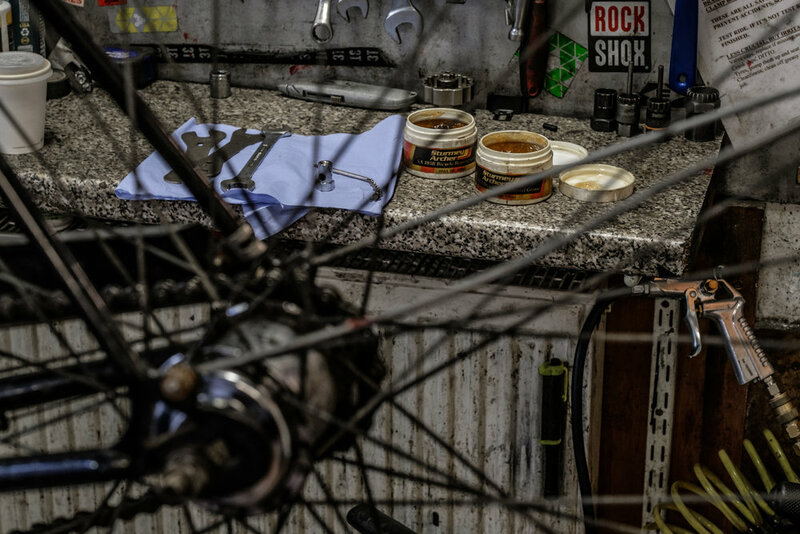 We either use Enduro bearings or genuine replacements. We can build either with supplied parts or source a variety of high quality hubs and rims. We carry most common sizes of spoke in stock, either DT Swiss or Sapim. 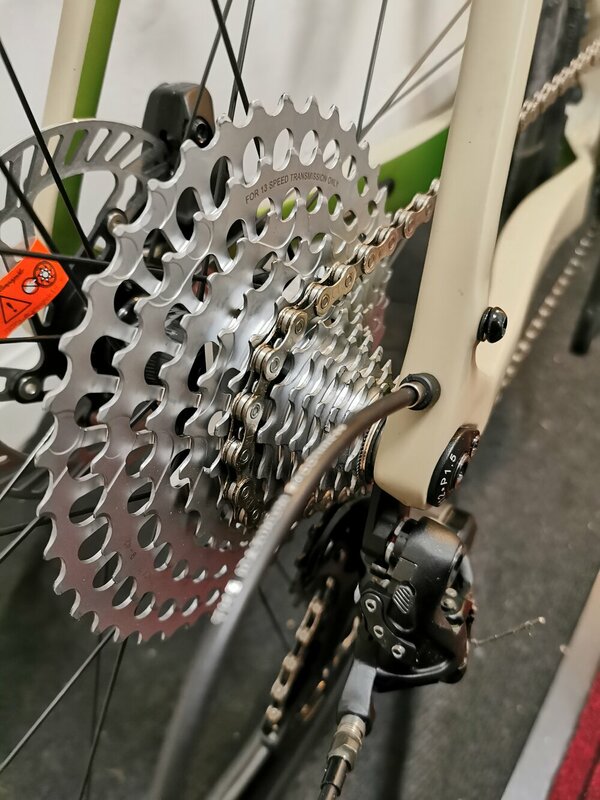 We custom build all kinds of bikes and are happy to do so with supplied components or can source whatever parts necessary. Build time and complexity can vary greatly so for a more accurate idea of costs speak to Dave or Euan who will be happy to discuss options. We have a lot of experience working on recumbents, trikes and other pedal powered vehicles, speak to Joe for any specific queries. We also stock a large range of tools and accessories for your bike.